Home / Sapphire Engagement Rings / “Jessica” beautiful green sapphire antique style ring. “Jessica” beautiful green sapphire antique style ring. Here is a beautiful ring set with an Australian green sapphire. It is a detailed, multil level design. The central oval cut green sapphire was 1.35 ct. The diamonds are various sizes and were set in tiers. The four largest diamonds are 0.05 pt each, and were set in the lower corners of the ring. The other diamonds range in size from 0.01 – 0.015 pt., all F/VS. We have made this ring with many differing central coloured stones, depending on the client’s requirements. 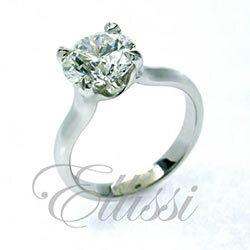 We have also made the ring with a diamond as the central stone.